I did an interview with TELL magazine earlier in the year, and I was really honoured to be featured in the edition for last week! You can read the attachment, or go HERE to read the full magazine from the TELL website. Special thanks to Tundun Adeyemo, who did the interview. I liked your answer to the question, "What skills have been particularly helpful?" 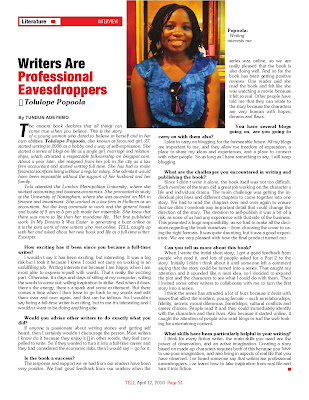 Professional eavesdroppers, very true. Oooooohhh...you've changed your template. This is so beautiful and definitely a good thing for your writing career! I love the progress you have been making. It does make me wish I could organize my life and put in a little more effort into my blogging/writing etc. But at the same time, knowing how much work it is to post and write so regularly, I just can't help but wish you the very best. Professional eavesdroppers and I will add professional curious being! Nice interview! I am encouraged on my part to keep blogging whether or not people read and stay on it till i achieve my dreams. 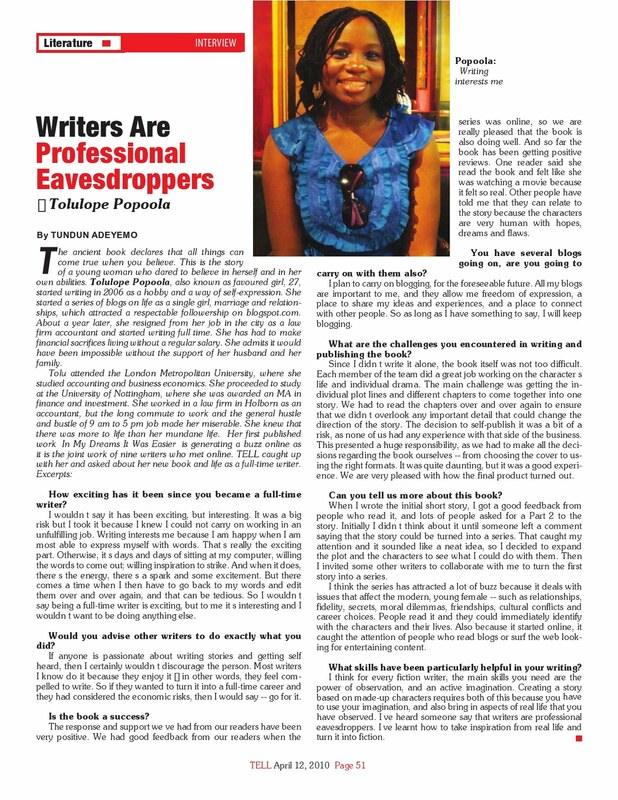 Also the last lines hit me;"Professional eavesdropper...."
I feel like writing because i have an experience and i hear a story. Something else tripped me,YOU LEFT your job for writing?So bold!!!. I actually get restless on a straight jacketed job,feels stifling and less fulfilling.Thumbs up!